The teachers at St John’s College integrate multiple IT tools into classroom activities in order to enrich students learning experiences. 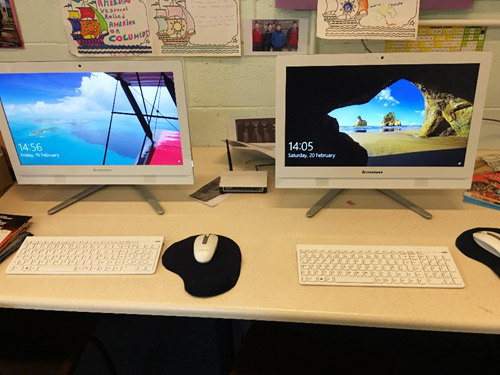 This can include interactive whiteboards, laptops, tablets and high speed internet access. In each classroom, teachers have a computer with internet access and a projector so they can have up–to-date facts and figures at their fingertips and present professional and easy to understand lessons which compliment the more traditional classroom tools such as white boards and textbooks. 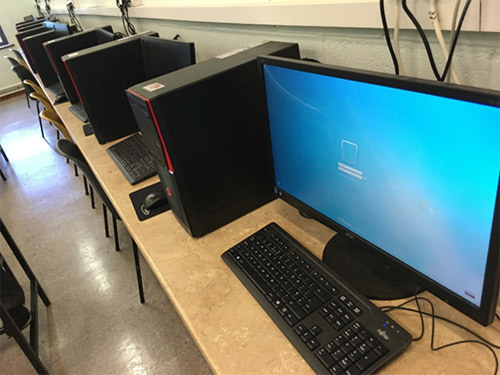 St John’s College has two computer rooms with print facilities and a Technical Graphics room which contains workstation class computers with powerful graphics cards ideal for CAD designs. Students can also access IT facilities in several rooms including the library and learning support room. When a student is enrolled in St John’s College they are assigned a unique login username and password. The student can then access their account from any computer terminal in the school. Students can securely save their work without any fear of data being edited/deleted by other students. Their accounts also include a teacher folder so they can easily share their work with teachers. All computers are installed with Windows 7 or Windows 10 and Microsoft’s suite of office programmes. The PCs are internet enabled but social media and inappropriate content are blocked. St John’s College prides itself on its modern IT facilities which give students ever opportunity to develop and explore their own IT skills. IT time periods are assigned in student’s timetables. This is advantageous to students in developing their skills whether they are novices or experienced users. Students are educated in the basics of computer hardware and computer networks as well as software. Students are given the opportunity to explore programming with applications such as “scratch”, website design with “Weebly” and in some cases basic video editing. Students also have full access to Microsoft Word, Publisher, Excel & PowerPoint and can familiarise themselves with these programmes which have become a mainstay in most modern offices and indeed homes. Students also have the opportunity to complete modules in the ECDL which is examined and accredited in the school. The ECDL modules are an internationally recognised IT qualification and give students a great start in the world of IT. In summary, St John’s College has kept pace with the modern world of IT to ensure that students will leave the school not only with excellent Leaving Certificate results but also with a good understanding and experience of the world of IT.